We are changing some behind-the-scenes, technical stuff with this site. It’s possible that it may be down for a few days. Never fear; we’ll be back soon! Hello again. It’s now a tradition of mine to post this each January. I hope you’ll enjoy it. Ten or 15 years ago January was last on my list. Back then I didn’t like cold weather, and January just seemed like a bleak, blustery, colorless month that had to be endured. I wondered if a person could get in on the bears’ hibernation deal. Whatever the reason, I now really like the first month of the year. While not my absolute favorite, it does have its charms. Yes, after Christmas and New Year’s, life resumes with the hustle and bustle of daily routines. …But overall, there seems to be a quiet simplicity that hushes the land. 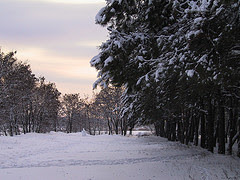 A brisk stillness that can be seen in bare tree branches and blankets of snow. It’s as if nature has paused for a moment.